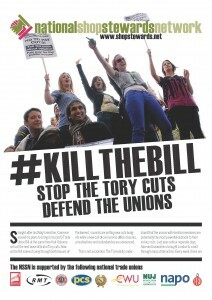 NSSN 285: Tories split as IDS resigns – joint action to stop the cuts! Millions of workers would have enjoyed their Friday night as the news filtered through that work and pensions secretary Iain Duncan Smith had resigned from the government because of the planned cuts to Personal Independence Payments (PIP). All those who have suffered from the brutal benefit cuts and sanctions as well as civil service workers who have fought job cuts, office closures and pay freezes will find his ‘redemption’ a bit far-fetched. But this episode has finally confirmed that what is potentially a weak Tory government – only elected by 24% of the electorate – is under huge pressure and is split down the middle. How do we finish them off? 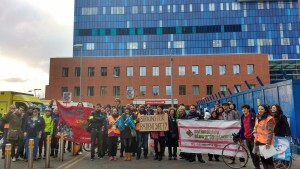 Junior doctors are looking to escalate their dispute and teachers are on the march over the plans to academies all remaining school in local authority control. All this while yet another wave of austerity is unloaded by Osborne. But if the Tories can be forced into a U-Turn on PIP, what could a mass movement of joint demonstrations and strikes led by the unions achieve? 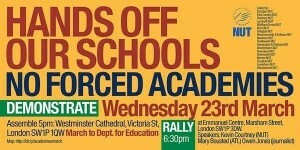 The NSSN calls on the unions to get together to agree co-ordinated action. We repeat our call that the People’s Assembly march on April 16th in London be turned into a TUC-led demonstration, which would pose the question about the action that is needed. But whatever the title of the April 16th march, we need to fill the streets of London for a massive ‘Tories Out’ mobilisation. We call on the TUC and the unions to finance as much transport as possible and get the word out to ensure that it is as big as possible and then start planning joint strike action across the NHS, education, the councils and the rest of the public sector which we believe would be supported by workers in the private sector, young people, pensioners and everyone who has been hit by the Tory cuts. Fight together to get the Tories out! 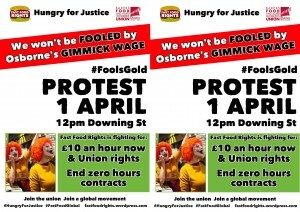 Fast Food Rights joins fast food workers across the world for #FastFoodGlobal Day Of Action 14 April – We won’t be fooled by Osborne’s gimmick wage! 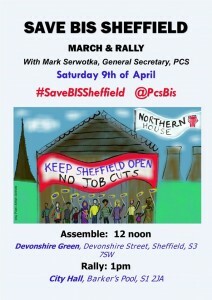 There will be a big focus in Wakefield, where on the day there will be a demonstration and social. The NSSN is delighted to announce that John Vasey a sacked CWU postal rep in Wakefield, West Yorkshire has finally been reinstated by Royal Mail (see CWU website). We now demand that Clive Walder gets his job back at British Telecom. Clive Walder, a longstanding leading rep in the CWU had an appeal against unfair dismissal rejected by British Telecom on 9 November, confirming his sacking after 38 years of service. Clive is chair of the CWU Birmingham, Black Country & Worcester branch. Clive worked in a BT call centre and was dismissed after an aggressive customer reported him to management just 33 seconds into a phone call. The decision was made without taking stress into account despite the local CWU branch reporting that 7% of staff at the call centre leave their jobs each month, some walking out mid shift. Management took the decision without consulting any medical advice or taking into account any mitigation. This year’s annual NSSN conference – our 10th – will be on Saturday July 2nd in Conway Hall, 25 Red Lion Square, London WC1R 4RL – 11am-4.30pm. Please put in your diaries!! 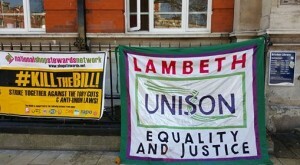 Lambeth library workers 48-hour strike to save libraries and defend jobs read more STOP PRESS!! Lambeth Unison members have voted for a council-wide strike over library closures by 85%! Not to book on for shifts after 21:00 hours Wednesday 23rd March 2016 until 20:59 hours Thursday 24th March 2016.